A few months ago, we talked about this poster by artist Stephen Byrne, imagining all of the Doctors from Doctor Who as the cast of a Disney animated film. 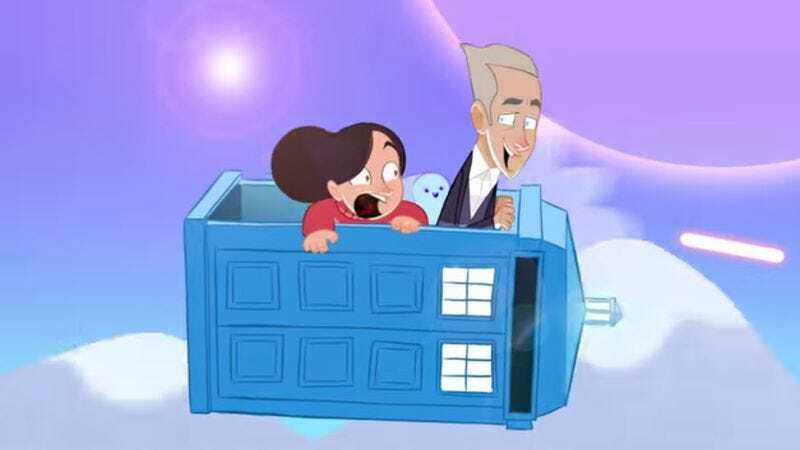 Now Byrne has taken that idea even further, creating an animated intro for a Doctor Who cartoon featuring Peter Capaldi’s Twelth Doctor and Jenna Coleman’s Companion, Clara, as they get into scrapes and adventures throughout space and time. And it is delightful. The clear inspiration here is Disney’s wonderful Gravity Falls, from Clara’s Mabel Pines-y sweater to the awesome clap-infused theme song by composer Jeff Ball. And while the animation is a little stiff in places, the character designs—especially the little bouncing Cyberman head mascot—are uniformly lovely, and the whole thing is full of cool little nods and references to the Doctor’s recent history.